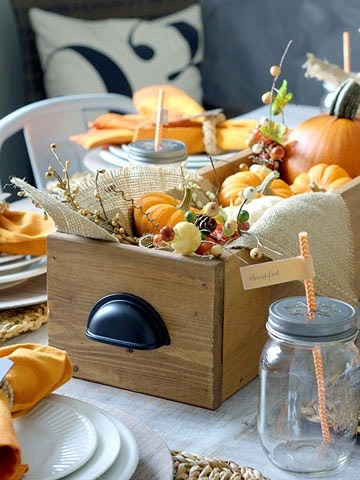 Wooden boxes can be used for all manner of things, including a tabletop conversation-starter. Go antiquing or piece together a simple box using wood and nails; then add oil-rubbed bronze handles to each end to make it a centerpiece that can move as easily as the conversation. Soft white and golden hues dance in natural lighting at this alfresco Thanksgiving table. 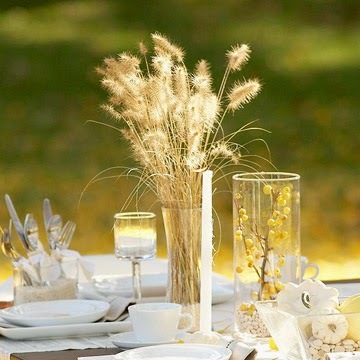 A vase filled with wheat adds texture to the centerpiece. Fill a tall cylindrical vase with dried white beans. Add a berried branch from a Golden Raindrops Crabapple tree to another vase to complete the setting. 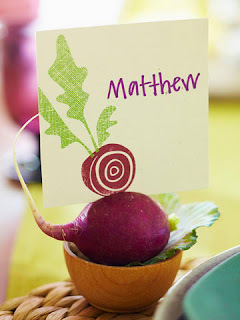 Bright radishes supply the inspiration for these sweet little place cards. Use small salt cellars or ramekins lined with a cabbage or kale leaf. Place a radish, cut with a shallow slit, on top of each leaf; insert a place card. Choose white pumpkins for a soft yet stunning arrangement that will stand out amid the Thanksgiving table fare. A bit of metallic spray paint can transform a few natural items into truly distinctive centerpiece elements. Here, a collection of vertical pieces -- an oak branch, magnolia leaves, thistle flower, allium, nigella seedpods -- were painted with copper paint. 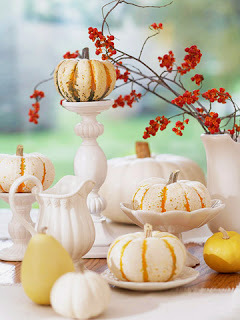 Place each item in a variety of shaped glass containers and place down the length of a table. 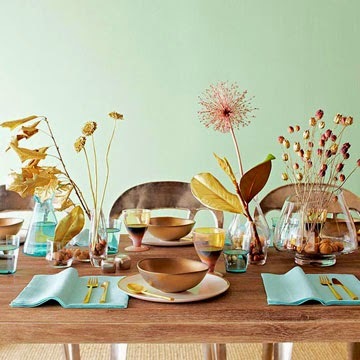 To pick up the shimmery paint tones, try serving pieces or flatware in gold tones, too.